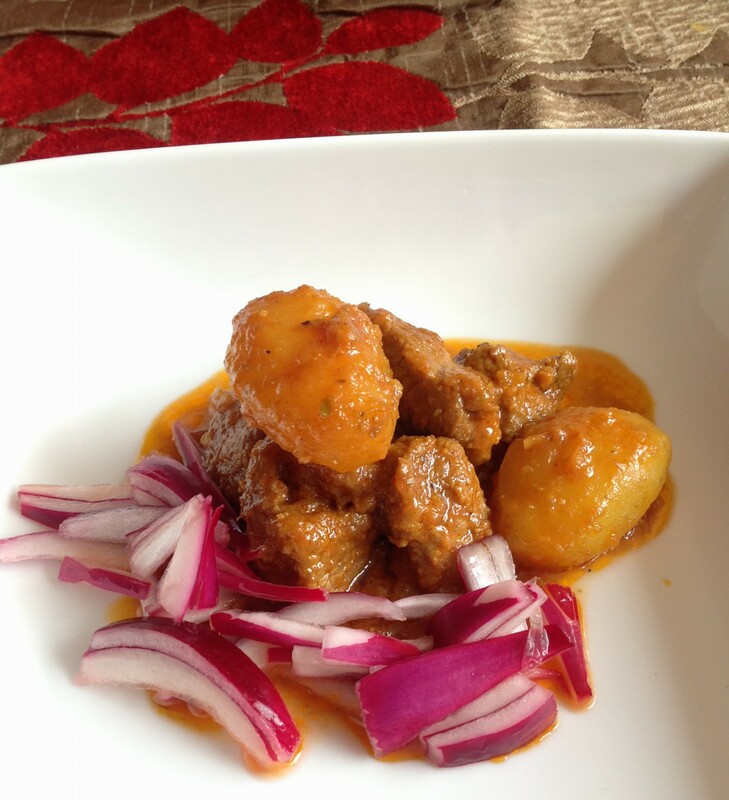 This delicious lamb curry is authentic Asian dish which is easy to make. It can be cooked with thick sauce or lightly soupy consistency. This can be eaten with boiled rice, hot chapattis, hot Nan, warm bread, bhaturas (Fried Puri’s). Baby potatoes can be also added to this dish as accompanied with vegetable. It can be accompanied by sliced red onions and cucumber salad with a dash of vinegar and salt to taste, or it tastes equally delicious with mixed salad and mango pickle (optional). In a bowl take 2 tsp oil, add 1/2 tsp salt, green chilies, ginger garlic paste, turmeric powder, Add the lamb and marinade overnight in the fridge. (This is optional to enhance the flavour to penetrate into the meat). In a heavy saucepan heat the oil on a low to medium heat. Add the whole garam masala and add the chopped onions. Stir and cook until the onions are golden brown ( not burnt). Add the marinated lamb stir and cook until all the pieces coated and turn brown. Cook covered on a low heat till the meat releases some of its juices. Add all the ingredients leaving the garam masala and chopped coriander. After 5 minutes add the chopped tomatoes stir, cover and cook on medium heat. Add water as required to avoid the curry sticking to the bottom. After 20 minutes check if the meat is tender and comes away from the bone. Add the garam masala powder and chopped coriander. Serve Hot with Hot Nan, Chapattis, Warm French bread or boiled rice. 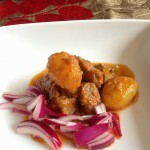 This delicious lamb curry is authentic Asian dish which is easy to make. It can be cooked with thick sauce or lightly soupy consistency. This can be eaten with boiled rice, hot chapattis, hot Nan, warm bread, bhaturas (Fried Puri’s). It can be accompanied by sliced red onions and cucumber salad with a dash of vinegar and salt to taste, or it tastes equally delicious with mixed salad and mango pickle (optional).